As a diabetic there are a host of health complications that can assail you. Skin complications during diabetes are quite common with almost thirty percent of diabetic patients suffering from some skin complication or other. Fungal, bacterial infections and constant itching is quite common in diabetes. Dry skin in diabetes is caused by the dehydration of the body due to the constant urinating to remove the glucose in the blood. The body turns the water into urine to flush out the high glucose in the blood. This causes dryness of the skin especially around the legs and feet. The fluctuations in the blood glucose levels can also lead to the dry skin symptoms in diabetes. Here are a few tips to identify diabetic dry skin symptoms. One of the common symptoms of diabetes is localized itching. As the skin becomes dry you tend to scratch it more. This leads to the skin around the area getting red and sore. Sometimes the intense itching and scratching can lead to a break in the skin. To avoid this it is essential for a diabetic patient to take care of the skin. Do not bathe for long hours in hot water. Use lukewarm water and a mild soap while bathing. Make sure that you moisturize your skin well after having a bath and whenever the skin feels dry. Avoid scratching as it can lead to worsening of the symptoms and even cause skin infections. If you have dry skin due to diabetes then your skin will start peeling and cracking slowly. This can be a breeding ground for bacterial and fungal organisms and should be avoided. Apply a good body lotion to keep your skin from becoming dry. Do not peel the skin yourself or use dirty nails to scratch the skin’s surface as it can cause skin infections. The high sugar levels in the blood provide excellent breeding ground for many skin infections. When the skin is dry and has been scratched too often it has cuts and wounds that these organisms tend to invade. Bacterial infections like folliculitis, boils and carbuncles are quite common in patients suffering from diabetic dry skin. Fungal infections like ringworm and vaginal infections are also common in diabetic patients. One of the best ways to avoid these symptoms is by taking proper care of your skin especially if you have open cuts and wounds, keep gauze pads and antibacterial ointments handy so that you can dress and cover up these wounds as soon as possible. In diabetes the feet tend to sweat less than they do normally. This causes drying of the skin around the feet and cracked heels. Neuropathy of the feet causes the skin to become dry and the toenails become misshapen. Avoid this by taking care of your feet. Apply a good foot moisturizer on your feet and wear well fitting shoes always. 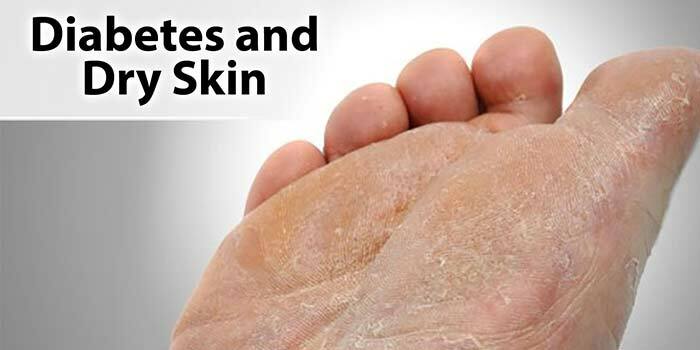 These dry skin symptoms during diabetes can often be alleviated with proper care. Keep your blood sugar levels in check and avoid drying out your skin. Apply a good moisturizer on your hands and feet to prevent skin dryness.